The Week In Reverse: Easy Monday to Elegant Friday? Here’s a thought. Is your office a casual sort of place? Are the dress codes flexible? Then why not start the week off on an easy note with a casual Monday and work your way through the week, dressing up more each day, ending on an elegant, dressy Friday. That way you’re ready for the evening with just a change of shirt. Sorry about the photo. Shirt, light blue with white stripes and white collar. Tie brown, light blue and gold pattern. Suit: Oxxford, mid-grey with tan pinstripe. Blue and gold silk square. Mid-brown, plain toe Martegani oxfords. 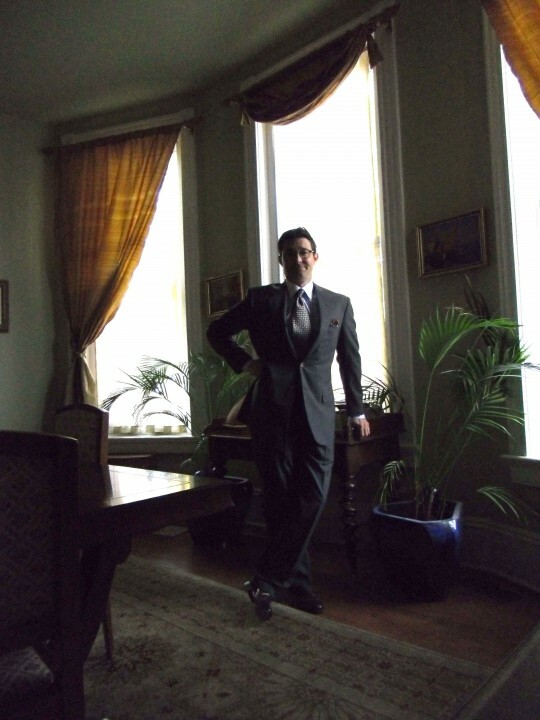 This entry was posted in Elegantology and tagged casual Monday, Easy and Elegant Life, Elegant Friday. Bookmark the permalink. 6 Responses to The Week In Reverse: Easy Monday to Elegant Friday? This is a great idea! And a great suit too. Boy, that suit just drapes beautifully; even better than the drapes do. Thank you Mr. Lane and Charles. It is one of my favourites. I should have had it rigged for braces though. But I hate to lose the double belt loop even though it’s not crossed into the Oxxford “X” anymore. Love this idea. And as always- you are dressed impeccably. The light in this photograph is especially nice. Do the windows face north by chance? The photo speaks quiet, confident elegance. The fashion magazines could take a cue from this photo, both model and setting. Paula, the windows face west. And thanks for the compliment. I had to monkey around with the photo, so I’m glad you think it turned out well. I’m curious, what does everyone think of the width of the tie? We have so many choices and I’ve resisted very skinny since they are inappropriate for my wardrobe (width of lapels and collar lengths).